Chair of expert panel on Utilisation of SSH research results for public policy design – The European versus the Latin American experience. Discussant of expert panel on Different dimensions of knowledge society capacity building in Latin America. As its final event EULAKS project held a policy workshop on September 23-24, 2010 at the London School of Economics (LSE). In the framework of the workshop main results of the analytical work packages of the project were presented to policymakers and targeted groups of stakeholders. The analytical tasks include a review on trends and patterns in the Europe-Latin America co-operation in the Social Sciences and Humanities (SSH), an analysis of the role of SSH for Science, Technology and Innovation (STI) policy design and implementation, and an analysis of scientific communities and research networks in both regions. Upon the research results policy recommendations for future policies were discussed during the workshop with the aim to support future SSH co-operation between Europe and Latin America. The discussions were enriched by keynotes from international experts on the utilisation of SSH research results for public policy design. Thanks to one of the Czech experts participating in the Security Group of the iKNOW workshop in the Czech Republic (Dr Vivienne Soyková), I had the opportunity to meet with the Ambassador of Venezuela in Czech Republic (H.E. Mr. Victor Julian Hernandez). During our 90-minutes meeting, we discussed about historical linkages and cultural similarities between Venezuela and Eastern Europe (e.g. the traditional role of the family as the most important institution driving societal change). We also talked about the need to promote participatory and prospective policy-making processes in Latin America, such as the Venezuelan Technology Foresight Programme. In particular, we exchanged ideas about strategies for science, technology and innovation (STI) knowledge and know-how repatriation. 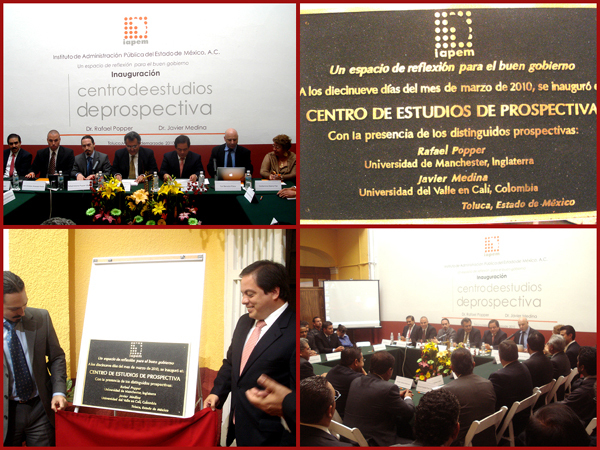 On the 19th of March 2010, the Institute of Management and Public Administration of the State of Mexico (IAPEM) opened a new Centre for Foresight Studies (CEP). The ceremony began with welcoming remarks from the President of IAPEN, Isidro Muñoz Rivera, who introduced some of the rationales and specific objectives of the Centre of Foresight Studies (CEP), for example: to undertake foresight studies in a context characterised by constant paradigm transformation; to visualise scenarios for better management and public administration practices; and to achieve desirable and possible futures through effective governance and participative policy-making. This was followed by a few words from the Head of the National Advisory Board of the Centre, Yuri Serbolov Palos, who briefly introduced the Mexican activities and major players in foresight. Subsequently, the Director of CEP, Christian Alvarado, introduced the two international speakers: Rafael Popper (keynote on Global Foresight Practices and Trends) and Javier Medina (keynote on Foresight in Latin America). Purpose – The paper sets out to explore the nature and degree of variation in foresight ‘‘style’’ across six world regions. The underlying hypothesis is that differences in regional context – in terms of political, socio-economic, and cultural conditions – will affect foresight ‘‘style’’. At the same time, a secondary hypothesis acknowledges that policy tool transfer and international learning might soften the influence of contextual conditions. Design/methodology/approach – Using the data collected for more than 800 foresight exercises in six world regions, the paper considers eight different dimensions of foresight ‘‘style’’, including domain coverage, time horizon, target groups, and methods used. It interprets regional differences (and similarities) with reference to dominant political and economic traditions in each region. In so doing, it tests the hypothesis that foresight ‘‘style’’ is influenced by regional context. 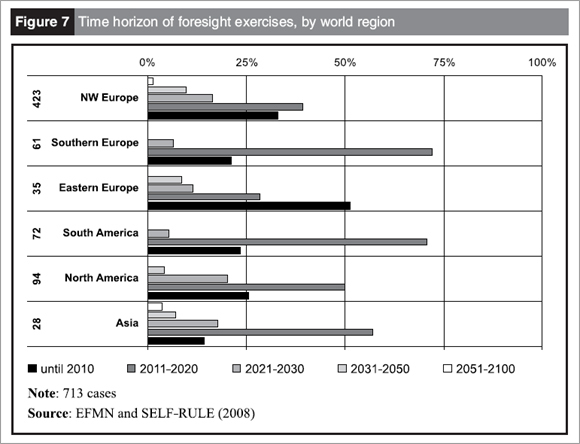 Findings – The analysis suggests that some foresight ‘‘style’’ dimensions vary between regions more than others. For example, there is marked variation in the domain areas covered by foresight across the world, while some regions appear to prefer particular methods over others. Time horizons also vary. For other dimensions, such as participation levels and the identity of target groups, there is a good deal of similarity. Thus, some dimensions of ‘‘style’’, at least at the aggregate level, seem to be more influenced by regional context than others. Originality/value – The paper is unique in being the first publication to survey such a large sample of foresight activity across a wide part of the globe.